What we experience as weather at ground level is the end result of what takes place over our head. Therefore to determine the forecast, and therefore the impacts, of weather we will need to determine the weather patterns in the upper air before looking at the surface weather. A sample 500 millibar level upper air chart. This depicts the wind speed and direction at an altitude around 18,000 feet (5,700 meters). The term "upper air" refers to the earth's atmosphere above about 5,000 feet (1,500 meters). It is from the upper air where we get our rain and drought, wind and calm, heat and cold at the earth's surface. The map (right) (below) was a picture the state of the atmosphere for a particular time at about 18,000 feet in altitude. 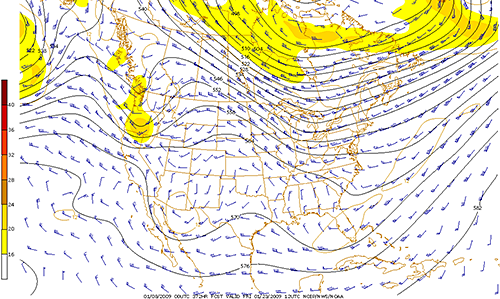 The lines represent the locations of various higher and lower pressure regions in the upper atmosphere. While upper air maps like this (and following information) can be rather complicated, this is the "meat and potatoes"' for the meteorologist. All weather forecasts stem from our understanding of the upper air where weather patterns such as ridges, troughs, upper air disturbances and upper-lows occur and where they are moving.